Cheating is a "bad thing", but it isn't necessarily black and white. Pretty much anybody is capable of cheating, and the motivation to do so is built into our society. Here's a look at why people cheat, and why such a bad thing isn't necessarily an indicator of a bad person. To understand why someone cheats, you have to consider why anybody makes a fearful decision. Say there's another person that you like and want to ask out on a date, but you're nervous and not sure if you can do it. Before you act, you often play out the outcome in your head by using the information you have and past experiences to fill in the blanks. Perhaps this person is very attractive and could be out of your league, so it's unlikely that s/he will be willing to go on a date with your and you'll be met with failure. Or perhaps you're too nervous to make a good first impression. On the other hand, things could go well, but asking someone out is a choice with potential negative and positive consequences. Not asking someone out doesn't change anything and therefore can't make anything worse. In this situation, many people will opt to do nothing because the downside — not having a new girlfriend or boyfriend — is preferable to the possible downside of being rejected. So what does this have to do with cheating? Cheating doesn't occur just because it's a possibility, but because the alternative to cheating is potentially worse. Say you're back in high school and you have a history test in the morning. History is your worst subject because you don't like it and can't seem to memorise a bunch of dates you find incredibly boring. As a result, there's a very likely chance you will fail the test and it will 1) negatively impact your grade, which 2) will negatively impact your chances of getting into the university you want, which 3) will result in an angry parent. Alternatively, you can cheat and be guaranteed a good grade. This, of course, comes with the risk of getting caught but you have to weigh that risk against the risk of failing — which is basically an assurance. Comparing this to the dating scenario, more people will choose to try and fail because it's the more assured outcome — like not asking someone out for dinner. Cheating happens when the risk of getting caught cheating isn't as scary as failing. With the dating scenario, you're more likely to ask someone out if being alone is scarier than being rejected. When cheating becomes the more attractive outcome, people choose it. Our system of compulsory (forced) schooling is almost perfectly designed to promote cheating. That is even truer today than in times past. 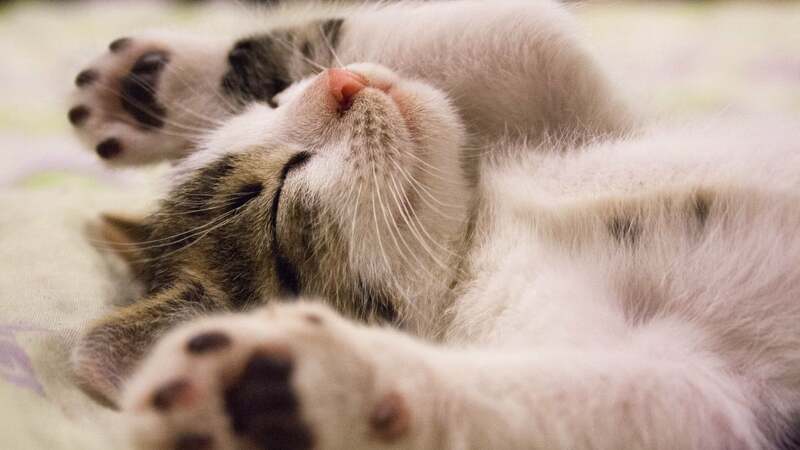 Students are required to spend way more time than they wish doing work that they did not choose, that bores them, that seems purposeless to them. They are constantly told about the value of high grades. Grades are used as essentially the sole motivator. Everything is done for grades. Advancement through the system, and eventual freedom from it, depends upon grades. If you create a summary sheet of the terms and facts relevant to a test and then consult that sheet while taking the test, you have cheated. However, if you create such a sheet and commit it to a form of short-term memory that lasts just long enough for the test and then vanishes, you have not cheated. If you create a term paper by copying out large chunks of other people's writing and pasting them together, that is cheating; but if you do essentially the same thing and then paraphrase sufficiently rather than use the copied paragraphs exactly, that is not cheating. Because the environment created by these factors is one where regurgitated information is seen as correct and what the individual thinks doesn't matter, there's not only cause to cheat but, in some cases, a level of resentment and disgust for the system that also encourages a cheater. It's a better alternative to failure. Pressure to perform in an arbitrary system where personal self-worth is determined by outside factors encourages the act. If you accept these arguments, then why do people continue to cheat after they've succeeded and no longer need to do so? Some people are self-destructive and like to push things to the limit, others are risk-seekers and enjoy the thrill, and some just enjoy feeling the power of getting away with something they shouldn't have. While these are all possibilities, they're not necessarily the personality types you'll commonly find. We want to look at cheaters this way because it's easier to vilify someone who's selfishly and compulsively motivated. The reality, however, is that we're all capable of cheating and it may continue beyond the point of necessity because the risk appears to be gone. When you find success doing anything, whether it's your job or salsa dancing or running a 5k, your confidence makes it easier to approach a given task because you know you can do it. The trade-off is that your confidence keeps you from accounting for new variables in a given situation and so you tend to simply repeat the behaviour you know has worked in the past. Going back to the dating scenario, if you succeed in asking a person out with one strategy you'll continue using the strategy as you believe it works. The thing is, it won't work in every situation and may actually work in very few situations. The same goes for cheating. The more you do it the more you believe you can get away with it, and the more you believe you can get away with it the less-scary the consequences become. If you're not afraid of the consequences, it's hard to see cheating as a poor alternative to doing the right thing. Of course, that brazen attitude is exactly how people get caught. Once your attitude has shifted to a place where cheating seems like normal behaviour, getting caught is a huge blow that brings you back to reality. For some, it even results in suicide. All of the sudden you have to face a reality where everything you think you've worked for and earned doesn't really exist. 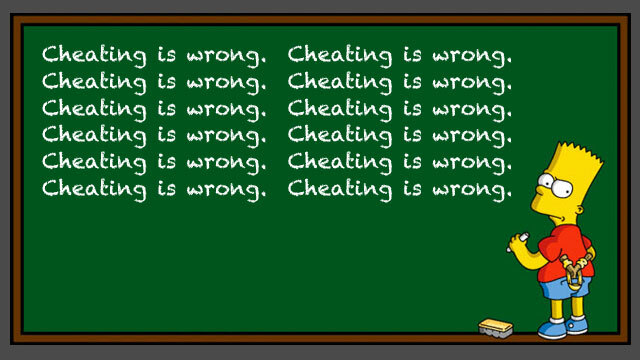 While cheating is ultimately a bad thing for pretty much everyone involved, it's not necessarily a black and white situation. It's not something only bad people do, but that most people are capable of and likely do to some extent over the course of their lives. Nonetheless, we have zero tolerance policies for cheating and plagiarism and that may be an overreaction. Instead of vilifying cheating, a better alternative may be to try and help the cheater recover. It may not be as deliberate as we'd like to believe. Sometimes things just get out of hand. This isn't to suggest a lack of punishment, but perhaps a little more leniency and understanding. Cheating is a bad thing, but its motivations vary. It may not be the product of a bad person. Want to read more about cheating? Check out the sources for this post. Cheating in Science Part I and Part II by Peter Gray, Why Rich and Powerful People Cheat by Dr David Schnarch, http://www.nytimes.com/2010/07/06/education/06cheat.html by Trip Gabriel, and How to Cheat at Everything by Allison Schrager. About the Dark Side Each week we take a look at good side of evil, whether it's ways to beat the system, how you can protect yourself from the dark side of the force, or the psychology of what's commonly considered to be bad behaviour. These posts will sometimes discuss things that require a set of flexible ethics. Your judgment and actions are your own, so think before you do anything you read here and only use your dark side for good. I think that a lot of times people cheat just to catch up (in the academic sense or with games, etc. )They cheat and don't get high marks, they cheat just to pass and not have to go through whatever painful thing they found too hard to do. That's a very strong rationalization for some people as it's not really hurting anyone, you're not taking anything from anyone such as status or marks, and you could say you're only hurting yourself but when it's something you just have to do and doesn't really apply later in life who cares. In games, works much the same way, except that the random nature of most games means that there's a narrower gap between cheating just to stay in the game and winning the game. An example: back when GTA vice city was the current game, I installed it. Playing through the missions was fun for a while, but I found I enjoyed the sandbox play much more. Logically, I cheated. I torrented a completed savegame and got the usual cheats to get all items, and spent weeks on end just freestyling around. I still break it out occasionally because it was so much fun. The mission-reward gameplay is good for having a game to sell, but I 'cheated' and skipped all the careful skill building and item-buying to the bit I found more fun. It hasn't seriously impacted my life, and never would have, and I saved a tonne of less-useful time. The same basic theory applies to cheating at school. If you're doing something you can't see any benefit for but you have to complete, cheating has no real downside.